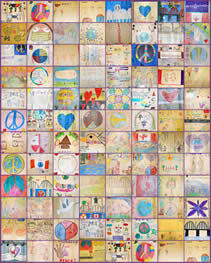 Many children and adults responded to our communities, sharing their experience of the Pen Pal Traveling Art Exhibit. Thank you for these words. Here are some of the responses collected. What stood out for you about the exhibit? How both communities are shown. All the talent that is in our own area, the willingness of people to work together. What started out small has grown, where will it all lead to? I was deeply moved by the themes of peace and unity. The energy and love for their community and all those within it. How much students understood of what was going on. To experience your art up close was a moving experience for me. Your art clearly says that you understand what friendship means and peace means. Genuine interest the children have wanting peace between our neighbours. How the children portrayed love, peace, harmony. Children carry no animosity. How children can vision peace. What image came to mind for you? I started to think about the freedom in Canada, about how our country is the best- Kyle age 7. The picture of the medicine wheel/peace was a good depiction of what peace is. The children show no malice. “Building Bridges” is the image that most strongly resonates for me. Our communities sharing the land willingly and safely. What does it suggest to you about what is possible? It’s possible to get along with people who look different and have different beliefs and traditions. It takes a little spark to create an act of love and friendship. If we (both native and non-native) listen to the kids- we can learn from them- just as our Traditional Teachings say. What will you take away with you from seeing our exhibit? A different positive view of Caledonia! Kids see things clearer than most adults until we adults contaminate their vision. People need to talk. Art gives them a common medium to express their feelings. I have many Native friends and have learnt about their traditions and religion and families, and I realize that we can all learn from each other. And we all should be proud and respectful of our heritage and culture. That my neighbours and community want to have government settle these issues that stand between us. Most of Caledonia want it brought to an end- the land claims. The people want these communities to stay friendly and peaceful. ‘Strangers’ in a populace can be lonely but this exhibit says ‘lonely no more’ – it is not ‘us’ and ‘them’ but ‘we’ who know each others names. I will take hope away with me. Don’t treat a person differently because of their race. I will take away the profound wisdom of the children. They lead the way for those who need assistance in seeing each person has value. Amazement at the expanding flowing. The children have a message for BOTH sides. This is truly a legacy for our communities. The artwork made me feel as though new beginnings are truly possible. That change IS possible, and with the right teachers teaching the right messages we will come together as one!! Peace is possible. Friendship is real. The powers at present should take the time to view the world through our children’s eyes. We must learn to respect all people- a great understanding of what is possible to achieve- love for one another. A feeling (great) of inspiration and hope.